COSY AND ROMANTIC apartment with 1 bedroom, 1WC, living room and fully equipped kitchen, terrace with a stunning sea view and an unforgettable sunset. Here you will feel "at home" and with a privacy that no hotel can offer you. Located 6 km from the village of Ferragudo, on the cliff, Beira Mar, with a magnificent view of the Atlantic Ocean and Portimão Marina, and 200 meters from the charming Caneiros Beach and 250 meters from the beautiful and sheltered Praia do Little pig. Ideal for lovers of nature, with a framework 100% nature of sea and vegetation and where you can enjoy watching the flight of birds, predominating seagulls, herons and swallows. The OCEAN TERRACES FERRAGUDO apartment is also ideal for those wishing to discover the Algarve because its location is in the middle of the Algarve coast. Ferragudo is a small fishing village in the Algarve situated on the Arade River estuary opposite Portimão. Very picturesque, the village is well preserved in its origin and offers cafes, ice-cream shops, restaurants, banks, post office, pharmacy, tobacconist and traditional commerce. During the summer there is an inflatable park where children can have fun and also have Kayaks for hire. Very close but in the opposite direction, about 9km is also the village of Carvoeiro. With a lot of charm and very touristy, Carvoeiro is very lively and visited by tourists all year round. If you like movement and nightlife, head to Praia da Rocha (about 8 km) where you will find lots of entertainment, many bars, restaurants and nightclubs. OCEAN TERRACES FERRAGUDO IS THE PERFECT PLACE TO ENJOY ABSOLUTE PEACE AND SILENCE IN A NATURAL ENVIRONMENT BUT CLOSE TO ALL ATTRACTIONS, ADVENTURE AND SIGHTSEEING. Perfect location. Beautiful scenery. Lovely home. Very clean. Care takers very responsive. Would definitely recommend to others and return!! We had an amazing stay here and highly recommend it! Unobstructed views over the water front and a series of walking trails right from the parking lot were fantastic...the trails led to two separate private beaches and the scenery was awesome! The furnishings were top notch and everything was perfect...the Jacuzzi was nice as well! We hope to return someday and if so would definitely stay here again! Thank you vey much Walter. We'll be very happy for receive you again...another time. 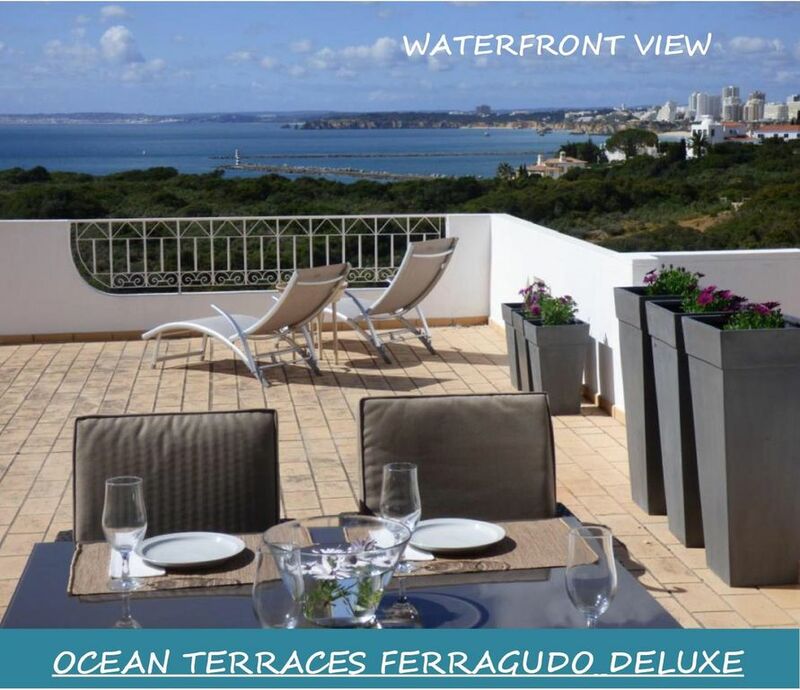 This is a great apartment with a huge terrace looking straight to sea overlooking the comings and goings into Portimao harbour. Facing west the sun was on the terrace until 6.30 even in October, before fantastic sunsets. Everything about the apartment is spotlessly clean and very comfortable, with a brand new sofa and really comfortable sun beds. Paula is very friendly and incredibly efficient, replying to any requests really quickly. It is a great place for a relaxing stay. We will be back. Wir hatten einen rundum Wunderbaren Aufenthalt in diesem Appartment. Das Ambiente in der Wohnung lädt zum Wohlfühlen ein und alle nötigen Haushaltsutensilien sind vorhanden. Die Terrasse ist sehr großzügig, Stilvoll und bieten einen atemberaubenden Blick auf das Meer inclusive der tollen Sonnenuntergänge. Wenn fragen aufgekommen sind hinsichtlich der Wohnung hatten wir einen super netten Ansprechpartner der uns kurzfristig geholfen hat. Wir können diese Wohnung sehr weiterempfehlen. We'll be delighted to host you another time. Wir haben uns sehr wohl gefühlt. Die Wohnung ist geschmackvoll eingerichtet und sauber. Alles wichtige ist vorhanden. Die Terrasse war groß und man konnte die Ruhe mit Blick aufs Meer genießen.